Bar is a steel product of any cross-section or size conforming to recommended country design code. For example, for British standards BS 4449:2005 or BS 6744 will apply. 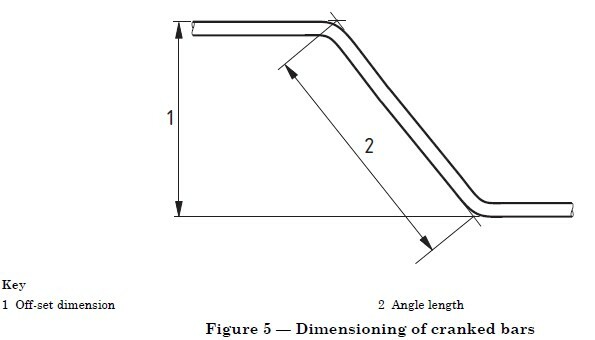 Nominal size or diameter is the effective cross-sectional area diameter of a circle, d of the bar. Usually size of the bar. Bar Mark is the identifying mark against each unique bar type in a drawing which refers to individual entries on the BBS. The same number is mentioned in the delivery label. A new number must be used if when the cross-section or shape or the length of bend is different. Shape code is a two-digit code which refers to the reinforcement bending shape. BS666 defines various shape and corresponding shape codes. Pitch/Spacing is the centre-to-centre distance between two adjacent bars placed in a pattern having same bar mark. Stock lengths are those lengths in which the manufacturer supplies the bar. Usually it is available in limited number of lengths of 6 m & 12 m.
The total length of any bar or fabric listed in the schedule should be in multiples of 25mm and the length of individual bends should be in multiples of 5mm. Depending on the diameter of bar, the code recommends a minimum radius “r” of bending. This value for minimum radius r has to be maintained while scheduling. For all shape meeting at an angle other than right angle, the dimensions are to be defined by co-ordinates as show in the figure and not in degrees of arc/radians. When bars are cranked, eg. as in two-way slab reinforcements, the overall offset dimension, dimension “1” shown in the figure, shall be not less than twice the bar dia. 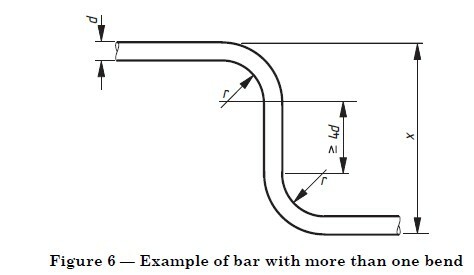 The angled length, dimension “2” in the figure, shall be not less than 10 x d for bars not exceeding 16 mm dia; and 13 x d for bars greater than 16 mm dia. When bars bends with a shape with two or more bends in the same or opposite directions in same or different plane, a minimum straight of 4 x d shall be included in BBS between curved portion, as shown. The value of “x”, in figure, shall be not less than 10 x d for bars not exceeding 16 mm dia; 13d for bars greater than 16 mm dia. This is necessary to prevent bar from developing fracture while bending. To consider the deviations in lengths during of cutting and bending, code recommends certain tolerances. 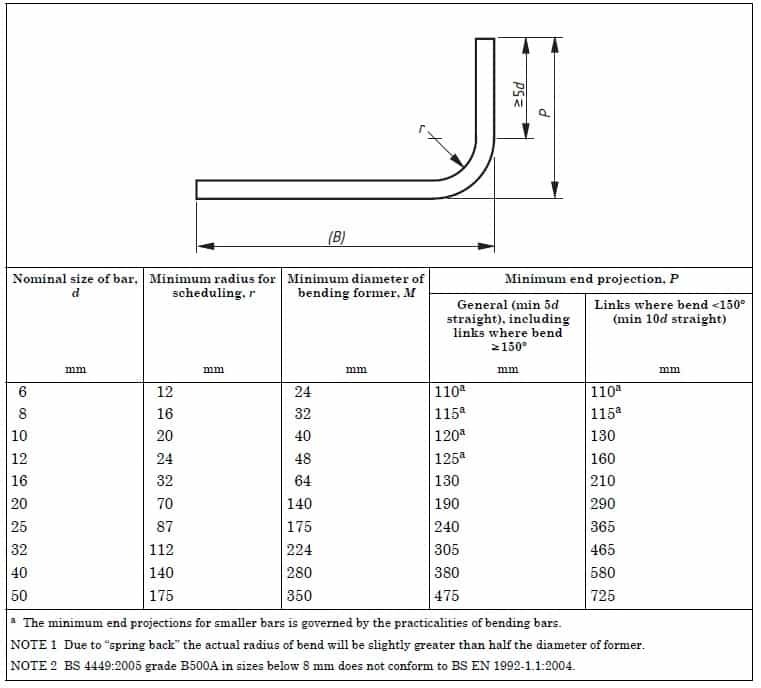 The tolerances for various bar diameters and bending lengths are shown below in the table. These lengths should be added while preparing Bar Bending Schedule.